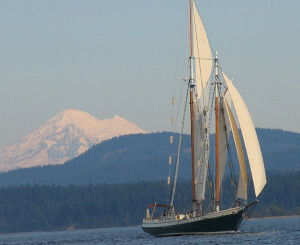 Schooners North sails from the small town of Friday Harbor in the San Juan Islands, Washington. The San Juan archipelago is a group of small fir tree covered islands in Northwest Washington State on the Canadian border. The waters surrounding the islands are teaming with wildlife including the iconic Orcas as well as Humpback whales, several species of dolphins, otters and a myriad of bird species including many bald eagles. The waters among the islands are well sheltered, peaceful and interesting sailing. Our islands are in the famous rain shadow of the Olympic peninsula giving us shelter from much of the Northwest’s rainy weather. It is very common to look up into a 50 mile wide, clear blue window of sky above with storm clouds on every horizon. 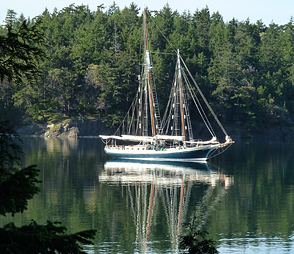 Enjoying the San Juan Islands from the deck of a beautiful Schooner gives a special perspective into this lovely area of the Salish Sea. Our cruises share the waters with whales, porpoise, seals and sea lions, otters and a plethora of sea birds. Learn about them and their habitat from our onboard naturalists. Relax and enjoy the natural beauty and breathtaking scenery, or take part in running the ship. Our experienced and friendly crew is always happy to share their knowledge and love of sailing. We offer day sails on our Coast Guard inspected vessel departing from Friday Harbor, on San Juan Island, throughout the season from May through October, including full day, half day and evening sails. 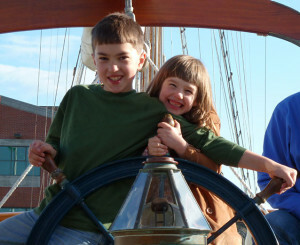 We also offer multiple-day adventures, special events, and your private sailboat charter. For more information, and availability email or call Schooners North at info@schoonersnorth.com or 360 378-2224. 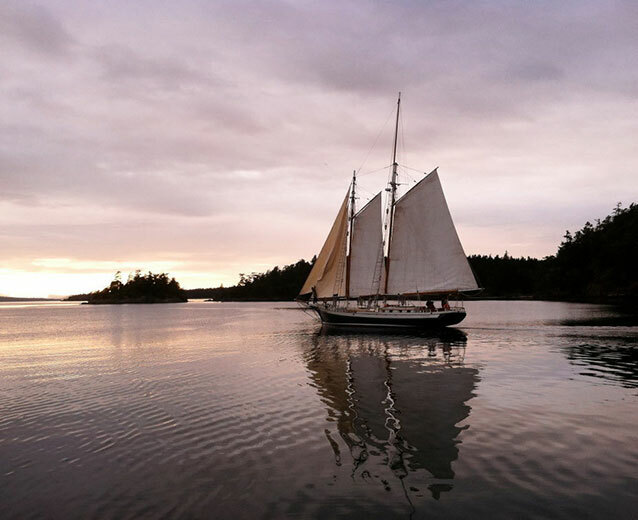 These three hour and full-day sails depart from and return to the Spring Street Landing dock in Friday Harbor, right next to the ferry landing. Our course is determined by the wind and currents. Heading up San Juan Channel, we sail between Shaw and San Juan Islands, passing Yellow Island, with it’s astounding variety of wild flowers in the Spring, and Jones Island, both are state parks accessible only by boat. On full days we’ll likely pass Spieden Island on our way to Haro Strait where we often encounter whales when they’re in the area. 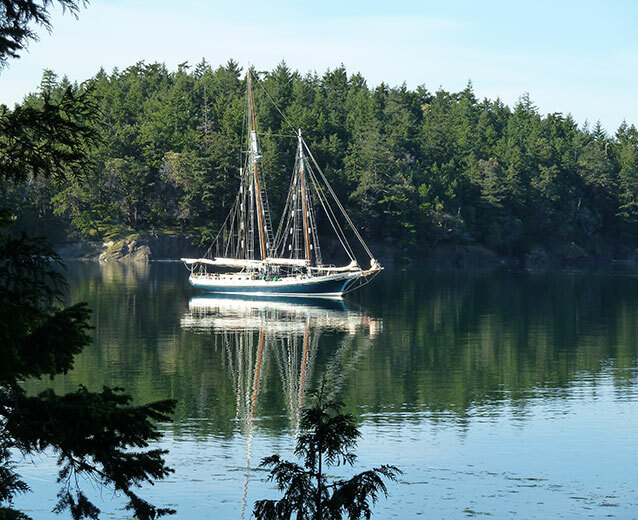 When we sail a southerly course from Friday Harbor we’ll go around Turn Island, another island park, and toward Lopez Island and Griffin Bay on the south end of San Juan. On a full day we’ll sail through Cattle Pass and on to Haro Strait, with panoramic views of the Olympic Peninsula and if we’re lucky, see whales. Half day 75.00/person; Full day 150.00/person. The perfect way to unwind after a full day of fun in the San Juans. Let Schooners North make it the beginning of a romantic evening or a relaxing end to a busy day. Evening sails last for two hours and we encourage you to bring your beverage of choice and a snack. We’ll be covering the same waters as the half and full days, just not quite as much of it. Evening sails are 39.00/person, children 2 and under are free. We love our friendly Canadian neighbors and enjoy visiting Victoria and their beautiful Gulf Islands. 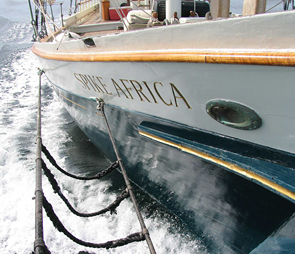 Spike Africa sets out on multiple-day adventures throughout the season. 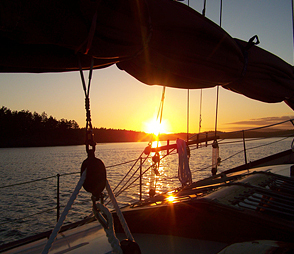 The sheltered waters of the Salish Sea present endless sailing opportunities. 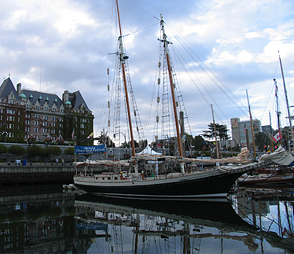 From busy seaports such as Victoria and Vancouver, to quiet lagoons, to sailing with the Orca whale, adventure awaits. Sailing with us can be a learning experience as well as pure pleasure and relaxation. 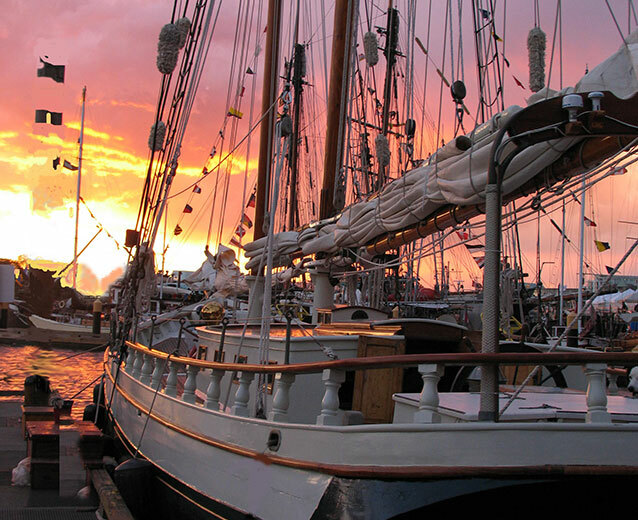 If you choose, we welcome you to participate in the sail handling and a shift at the helm. 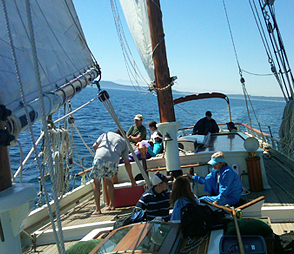 Open sailboat charters are available to individuals or groups. A great opportunity to meet happy people. There is nothing like a peaceful sail to brighten your spirits. Call our office for the latest information. New multi-day cruises are forming all the time. 360-378-2224. Private Charters are also available to individuals or groups. 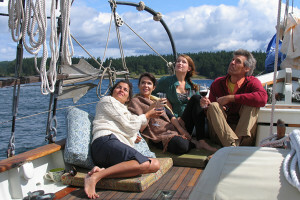 Private Sailboat Charters allow you to set your own itinerary according to your individual interest. Visit our private charters page for more information. Or call us at 360-378-2224. You don’t have your own 80′ schooner? Not a problem, you can have ours, with a full crew at your disposal, and we’ll be sailing on your schedule and your itinerary. There are so many great reasons to make our boat your boat for a day or for several; weddings and wedding parties, bachelor parties, family get-togethers, romantic get-a-ways, birthdays, corporate retreats, any special occasion that calls for something extraordinary and unforgettable. When you charter our schooner for your own special occasion we’ll do all we can to make it a once in a lifetime experience. With our local knowledge we can help you plan your event and destination. We have gourmet chefs to handle catering, and Spike has a full galley to help with food preparation and serving. 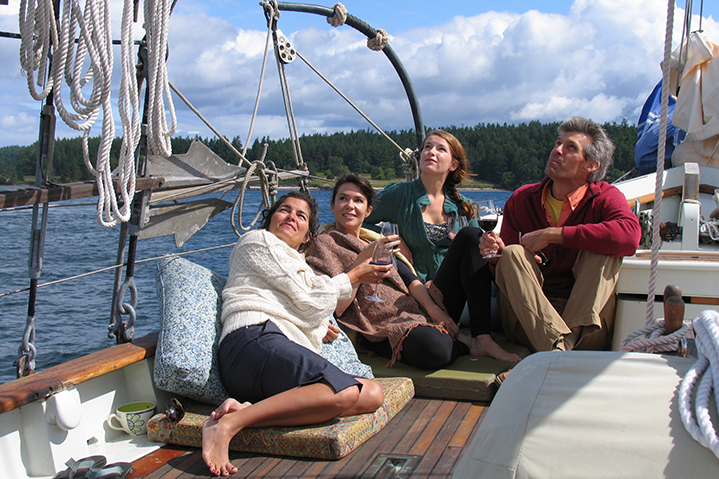 We sail from San Juan Island, however, other pick-up and drop-off locations can be arranged. A burial at sea is a dignified and beautiful way to pay your respects to a loved one that has passed away. We realize that if you are requiring this service it is a sensitive time, and we’ll do all we can to make it a positive experience. Federal regulations require that the ceremony be performed at a minimum of three nautical miles from land. 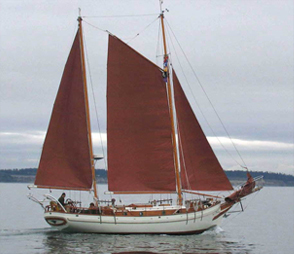 Haro Strait, which lies between the Islands and the magnificent Olympic Peninsula is easily reached and returned from in a day and is the only local area that will allow us to sail far enough off shore to perform the ceremony. We can help with the permit process, and with your accommodations while you’re on the island. 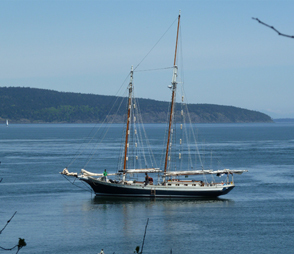 The San Juan Islands have several marine state parks that can only be reached by boat. We’ll be sailing to these lovely gems this summer and grabbing a mooring buoy or dropping anchor then heading to shore for some hiking and exploring. We’ll end the day cooking dinner and telling stories of our adventures around a campfire before turning in aboard the Schooner or camping ashore. Cost is $420.00 per person/day. Let us make your wedding, party, family adventure, company gathering, or other special time an extraordinary experience that you and your guests will always remember. We can accommodate creative events from corporate team building to private memorial services. Whatever your occasion, planning it on a classic vessel will guarantee to make it special. Call 360-378-2224 for more information about our special events. Join us on an a full-day “Orca & Wildlife Quest” to sail safely and quietly amid these beautiful residents of the Salish Sea. Food is provided by the best restaurant in Friday Harbor, The Cask & Schooner. Call 360-378-2224 for more information. Bring your own snacks and beverages or box lunches are available through the Cask & Schooner Public House & Restaurant. All box lunches include sandwiches served on fresh Bakery San Juan Giovani Bread, salad, sweet treat, San Pellegrino sparkling water, napikins & utensils. Sandwich choices may include the following: smoked salmon, drunken chicken, skirt steak, smoked ham, veggie or a rustic blt. Also available for an additional cost are: Stumptown coffee, tea, Dry soda, rootbeer, ginger beer, Growlers, wine and hard cider. Please proved 24 hour notice, payment is due upon order, please mention any dietary restrictions and pick up is at 10am. Box lunches start at $23. available from Cask & Schooner, 1 Front St., Friday Harbor, WA 98250. Call 360-378-2922. 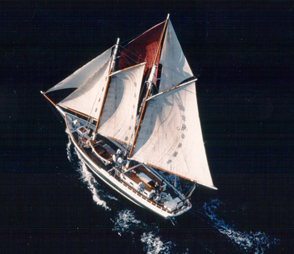 Call to book your sailing adventure.